As part of The Ragi Project, the students and staff of Poorna Learning Centre in collaboration with Azim Premji University, began a series of culinary experiments in the school kitchen using ragi. Their mission? To present the 'humble health food' in new ways that children would love. They scoured recipe books, coaxed out of grandmothers the secrets to family favourites, and created new recipes of their own. The book Our Experiments with Ragi is the culmination of this effort of several months of research and recipe testing. The beautifully illustrated book is well balanced between crowd pleasers such as cookies and chakli and staples like malt and roti, but the use of ragi is what ties all the 16 recipes together. There is also an attempt to feature regional foods such as this recipe for ragi muthiya. Muthiya are a favourite among Gujaratis - eaten as a teatime snack or dunked into the hearty winter delicacy, undhiyu. They are deep fried or steamed dumplings that derive their name from the way the dough is shaped into squat oblongs using the fist or mutthi. Traditionally, muthiya are made with a mix of whole wheat and chickpea flours, greens and spices. Sometimes, vegetables such as ash gourd, carrot and cabbage are added into the dough to give the dumplings heft. Healthier versions of muthiya substitute atta with bajra or jowar flour. Mix the ragi, flour, wheat flour, chopped methi leaves, oil, salt, ajwain, turmeric powder and chilli powder. Knead it into a chapati dough-like consistency. Pinch small balls of dough and roll them into cylinders. Steam the cylindrical rolls for 20 minutes. Then cut into small pieces, season with oil, mustard, til, hing and curry leaves and serve. 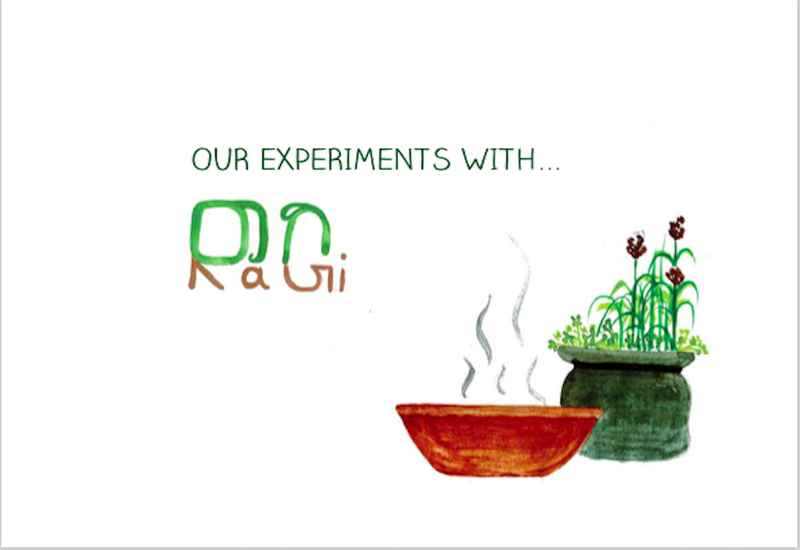 Download an e-copy of Our Experiments with Ragi here.